This is the perfect sofa for sprawling out. A deeper seat design allows better relaxing, sleeping on the sofa, and makes it easier for kids to curl up with crossed legs. The kids won't be able to fight over who gets the sofa, either, as a wide seat box provides plenty of room for everyone to squeeze in. You'll be happy to know that there is such a stylish sofa that can please kids and grown-ups, men and women, humans and pets alike. The Hannah Contemporary Sofa with Deep Seats by Studio 47 at Morris Home in the Dayton, Cincinnati, Columbus, Ohio, Northern Kentucky area. Product availability may vary. Contact us for the most current availability on this product. Modern yet casual, the Hannah collection provides versatile seating that works equally well in the living room, family room, or rec room. 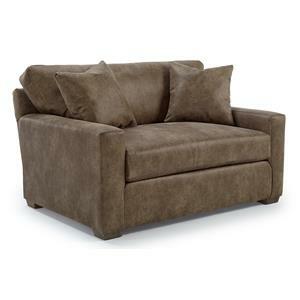 A deep, relaxed seat design and spacious proportions make both the sofa and chair-and-half ideal for lounging around. Hanging out with the family or inviting friends over, you'll be sure to have comfy seating for your whole crew. Choose your fabric to best tailor the Hannah group to your design preferences and lifestyle, including available options of durable, stain-resistant performance fabric for the busy family with young kids or pets. The Hannah collection is a great option if you are looking for Contemporary furniture in the Dayton, Cincinnati, Columbus, Ohio, Northern Kentucky area. Browse other items in the Hannah collection from Morris Home in the Dayton, Cincinnati, Columbus, Ohio, Northern Kentucky area.